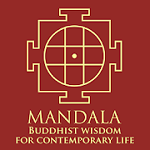 Berkeley, CA (USA) -- One of the central tenets of Buddhism is non-attachment -- the idea that we live in a world of constant change and therefore shouldn't hold onto anything too tightly, whether it's our desire for material success or our fears of losing loved ones. Everything is impermanent. 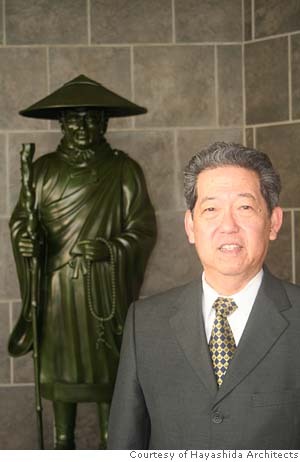 It's a principle that Sady Hayashida, a Jodo Shinshu Buddhist, takes to heart. Hayashida, a soft-spoken, 63-year-old architect who lives in Berkeley, was born in a Japanese American internment camp in Topaz, Utah. All of his family's possessions were confiscated by the federal government during the war, and, like a lot of Japanese Americans, they had to start their lives from scratch after leaving the camps. After getting his architecture degree at UC Berkeley in the 1960s, Hayashida let go of something else: his design for a Buddhist cultural center. It was an assignment in school, and he never thought it would get built. But 40 years later it opened in what used to be a car dealership in downtown Berkeley. The Jodo Shinshu Center is the largest center for Buddhist learning in the country. I spoke with Hayashida last week about his family's experience during the war, his Buddhist beliefs and the laws of karma. Do you remember much about life in the internment camp? Not really. I was just a couple of years old when we left after the war ended in '45. I do know that it was a degrading experience. We were essentially treated like second-class citizens. Our rights were taken away from us. When we came back, I remember being spat upon by schoolchildren my age. It was obviously a negative feeling. How about your parents? What was it like for them? I think that there were good sides and bad sides for them. The good part was that they were there with friends that they had grown up with. So it was kind of like going to summer camp. The bad news is that they lost everything they owned. They didn't have much to begin with, but anything in savings was confiscated. Everybody has different stories about the kinds of material things they lost. Some people owned businesses. Other lost their money or cherished belongings. My father told me that he was forced to burn his wooden kendo equipment because the government didn't like him practicing Japanese martial arts. That was part of the paranoia at that time. Anything Japanese was looked upon as threatening by the government. Were your parents angry about what happened? There is a word in Japanese -- gaman -- that means quiet patience. It's difficult to translate, but it's kind of like you wait out a situation, do what you can and not look back. You don't make a big deal out of it. Another Japanese word is shoganai, which basically means "It can't be helped -- that's just the way it is." I think their attitude was to leave the past in the past and let's go forth. You've been a practicing Buddhist all of your life. What was it like growing up as a Buddhist in Berkeley? I don't think I felt any different from anybody else, to be honest with you. We had Sunday school, Sunday services and a lot of social activities connected with our temple. Tell me more about Jodo Shinshu, the tradition that you follow. How is it different from other branches of Buddhism? My perception is that Zen Buddhism is more meditative, more introspective than Jodo Shinshu, which is almost like going to a Christian church. We have Sunday services, and meditation is not the core of the practice. Also, whereas Zen is based on the idea that you can achieve nirvana through your own efforts, Jodo Shinshu teaches that people become enlightened through their faith in Amida Buddha. Amida Buddha is described as the Buddha of infinite light and life. To me this is a metaphor of the ultimate truth. To focus on the Amida Buddha is to focus on the ability to see and understand the ultimate truth, which leads to one's awakening. The way I look at Buddhism in general -- and I'd like to speak as a generalist -- is that it's based on how one lives one's life. It's a philosophical approach. To me the most important idea starts with what the Buddha said: "All of life is suffering." The basis of suffering is attachment. When you can't get that BMW or the house in the suburbs or that relationship with a particular person, there is disappointment. It creates envy and jealousy. Of course, even if you get the BMW you could wreck it, or if you buy the house it could burn down. Again, anguish and suffering occurs. What Buddha teaches is that this suffering is a part of human existence. That doesn't mean we don't strive for material things. It's just that we understand that at some point they will no longer be there. Everything is impermanent. And how does that apply to your life personally? I look at things differently now than I did in the past. I think this comes with experience. The material things I wanted when I was younger no longer have the same appeal to me. It's not that I don't appreciate material things, but I understand that they can be lost or gone tomorrow and I am able to accept this more easily. The loss of loved ones is the most difficult to accept. As one grows older, the more of your parents' generation pass on. I lost two good friends in the past few years, and although it was very difficult for me to see that happen, I understood that it was part of life and impermanence. 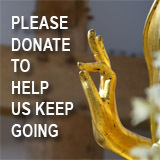 It was Buddhism that helped me through this time, along with the support of my wife. My understanding is that Jodo Shinshu Buddhism teaches that faith in Amida Buddha cuts the bonds to our negative karma -- past, present and future. Is that right? I guess that's one way of putting it. When I think of karma I think of something that we are constantly creating and correcting by our actions or reactions. Exactly. What you do today will affect you tomorrow. What you do today will affect everybody tomorrow, too. It will come back to you. How do you explain the Japanese internment camps in terms of karma? If you believe in karma, you believe things happen for a reason. For what reason do you think this happened? I think the reason has to do with political rationalizations that were made during that time. We all know that the Japanese had made great economic gains in California and the West Coast, particularly with farming, and a lot of people were jealous of that. They took advantage of the war hysteria at that time to take over. But I suppose that if you believe in karma, you might say, "Well, what did we do in the past that landed us in the camp?" I don't think that the Japanese Americans caused it to happen. I think it was the fact that the Japanese Americans of my parents' and grandparents' generation worked hard to do what they had to survive. They did all the menial things that other people didn't want to do. But they also took on farming in areas where farming wasn't that good -- the soil was bad, and they turned that around. And so what they did was to make things better. And then it created jealousies, from my perspective. I think the good that came out of that experience is that it made us stronger as Japanese Americans. We had to be better. We had to do more to achieve the same goals as our white contemporaries had achieved. We had to work harder, be better in school. You know, instead of doing 100 percent we did 120 percent. What kind of work did your parents do? My father was a gardener, and my mother was a domestic. She did laundry, housecleaning -- things like that. Eventually, my father started doing electrical work and then small remodeling jobs, which is what he really liked to do. That's why I went into architecture. He saw his contemporaries working as architects and making more money than him. Of course, if my father were alive today, I could tell him it isn't as easy as it looks. The Buddhist center that you designed here in Berkeley was actually a project of yours started in architecture school at Cal. Did you ever think it might get built? Not really. At the time, I presented it to some Buddhist ministers, and their comment was "Nice dream!" Sort of like "OK, now back to reality." I think that had a lot to do with the fact that at that time these kinds of developments were too expensive for them to contemplate. How does the current building match that long-ago plan? Is it pretty much how you envisioned it? Well, no, it's quite different. That design was on a park setting. This is an urban area, so we stacked the components that I had in my original scheme. Obviously, the criteria for the building have changed as the needs of the organization have evolved during these 40 years. Is it surprising that you ended up getting it built using something that you dreamed up when you were in architecture school? I competed against three or four other firms that were very reputable firms, and I felt honored and lucky as well to have been chosen. My own temple is right behind the site. My father was very active there, and my grandparents and great-uncles were almost like the founders. Earlier, we were talking about attachment. You're an architect and you build things to last. Does that mean you are OK if somehow this building becomes something else someday? What if it turned into a theme restaurant or something? I don't have a problem with that. This used to be a Buick showroom. It also used to be a Chevrolet dealership for Reggie Jackson. Now it's a Buddhist center. But tomorrow, who knows? Hopefully, this will be here for a while so that it could be a springboard for the future of Jodo Shinshu in America as well as for other people. There is this parable about a man who is lost at sea, and he finds a piece of wood that he can float on, some flotsam out there, and he is able to get on top of that piece of wood and make his way to shore. But because of his attachment to that piece of wood he carries it on his back for the rest of his life -- to no avail really, because he just couldn't let it go. The idea I hope to live by is that I can let it go. I can let it go and go forward. What about your family? They lost everything they had. Were they able to let go of that? They had to. I mean they did it with anguish! I'm sure it was with sorrow -- I'm not just talking about my parents, but also other parents who had had businesses, owned grocery stores, farms, all those things. They had to let it go because that was dictum of the time. And then they had to come back and redo everything. Do you talk to your family much about their experiences during the war? My father passed away 30 years ago, but my mom is still alive. She only looks at the happy memories of that time, not the bad things. She tends to be that way, and I think that's how she has been able to survive. Many Buddhists believe in reincarnation. What about you? I don't believe in an afterlife. People would like to believe that their soul continues on after they die, but I don't look at it that way. So what do you think happens when you die? I like to think that when I die I will leave behind good things that people remember and in that way I will affect other people. It's like this web where I pull on one knot and it affects all the other portions of the web. And so I pluck that and hopefully I plucked it in the right way. I've done my bad stuff -- don't misunderstand me -- just like everybody else has. But I hope I'm leaving behind more of the good stuff than the bad stuff and that people will remember me with some good things that I've done.